Math for Excellence is a year-long Math Enrichment Program® for elementary and high school students in grades five and higher. At Math for Excellence, our teachers and students love math! We believe that mastering math is the key to success in any field, from science and engineering to business, medicine and sports. Our goal is for students to significantly improve their grades, increase their understanding, eliminate the need for tutors, and realize that math can be fun! Students in this program establish a solid foundation in mathematics, and develop critical thinking and problem solving skills. Students in our program will learn from a combination of Singapore Math textbooks and more challenging math problems compiled by our instructors. The problems are selected from best textbooks in countries where math is the dominant subject. Math for Excellence is not a remedial tutoring program. It is designed to give our students more than they get in school. The classes run bi-weekly from October to May and they are 1.5 hours long. Our students are often surprised by how quickly the time goes by. The classes are dynamic, interactive, engaging and fun. We teach new material, show examples, practice and explain homework. And we always answer all of our student’s questions! Math for Excellence covers six levels of comprehensive curriculum designed to give students a solid foundation in mathematics, and develop critical thinking and problem solving skills. The material is carefully designed to cover key math areas such as Algebra, Geometry, Trigonometry, Fractions, Pre-Calculus and Calculus. We empower and challenge our students to achieve success in both their academics and their career. The results speak for themselves through students’ increased confidence, their love of math and improved grades at school. Our students get accepted to universities of their choice and succeed at university level math. Math for Excellence is the result of Mr. Katic’s life work. 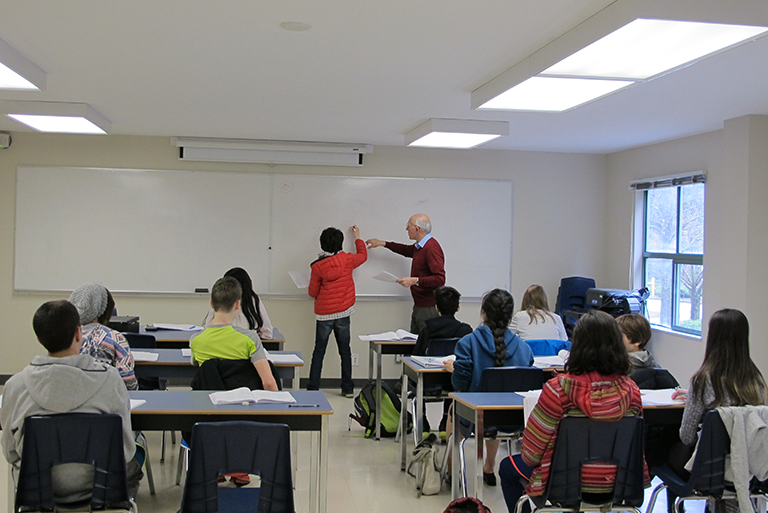 This is not the first math enrichment program Mr. Katic created in Canada. The key factor in achieving a high level of quality in a program, Mr. Katic observed, is that it is not enough for teachers to be educated in math. The teaching staff needs to provide a consistent approach and class structure, as well as follow the proven teaching methodology, and be enthusiastic about mathematics. This enables a seamless transition for students from one level to the next. All instructors teaching this program are specially trained, approved and certified by Mr. Katic.